Between 3% and 4% vol. Our Cidre Pays d’Auge is made in the respect of traditional process making methods : first the apple are picked up to the right maturation manually or mechanically / washed / crushed / the pulp is put into a vat open air to give the juice its colour and to release its aroma / the pulp is then pressed within an average productivity of 650 most liters per ton of apples (productivity limited to 750 liters) / natural clarification of the most / slow alcoholic fermentation (1 to 3 months) / natural froth creation in the bottle (minimum 3 months). 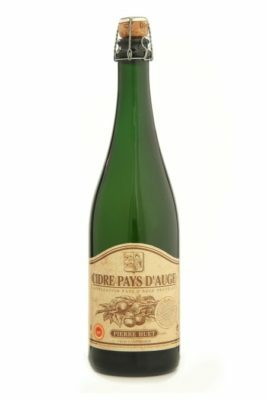 After an analytical and organoleptic control made by the INAO (Institut National des Appellations d’Origine), the Appellation Cidre Pays d’Auge can be obtained. Non pasteurized cider, natural fermentation in the bottle.